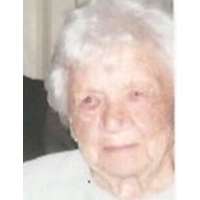 Rose F. Toscano, 98, of Bristol, wife of the late James S. Toscano, Sr., died on Friday, January 18, 2019 at Sheriden Woods. Rose was born in Bristol on April 2, 1920 and was a daughter of the late Edward and Lillian (Johnson) Maynard. Rose is survived by her son: James Toscano, Jr and his wife Joann of Bristol; brother: Charles Maynard; six grandchildren: Kelley, David, Kathleen, Colleen, Heather, and Christopher; thirteen Great Grandchildren; four great great grandchildren; and several nieces and nephews. In addition to her husband and parents, Rose is predeceased by her daughter: Sharon Toscano; her grandchild: Patrick Toscano; and her great grandchild: Anthony Toscano. A Prayer Service will be held on Thursday (January 24, 2019) at 11 AM at Funk Funeral Home, 35 Bellevue Ave, Bristol. Burial will follow in St. Joseph Cemetery, Bristol. Relatives and friends may call on Thursday (January 24, 2019) from 10 AM to 11 AM at Funk Funeral Home.